Books on the First World War traditionally say that by the end of 1914, "there was a line of trenches stretching from the North Sea to the Swiss frontier". That is usually the extent to which Switzerland’s part in the First World War is considered. Does this matter? Surely being neutral - as Switzerland was throughout the conflict - means you’re not involved in a war? 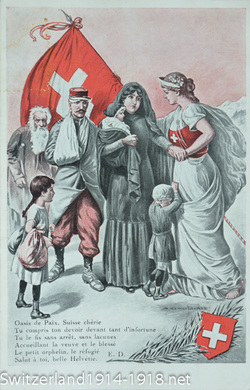 In fact, Switzerland could not escape the effects of the First World War. Swiss people may not have died in their thousands in the heavy fighting that was taking place not far over the border, but the years between 1914 and 1918 were still a time of great change for them. The Swiss were closely involved with the war and with the belligerent countries in a variety of ways, as this website describes. Read more about the point where the Western Front met the Swiss frontier (shown above). Above: First World War postcards showing Switzerland as an "Oasis of Peace" among the warring countries of Europe. 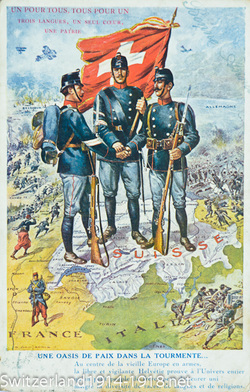 That on the left shows three Swiss soldiers and emphasises the need for unity among the Swiss, and that on the right illustrates some of the humanitarian causes that the Swiss were involved in. Follow me on Twitter to see more photographs and information on Switzerland in WWI. -- Swiss memorials of the First World War. -- "Kilometre Zero: Where the Western Front met the Swiss frontier. -- The Swiss frontier in the First World War. -- Swiss munitions manufacturing during the First World War.